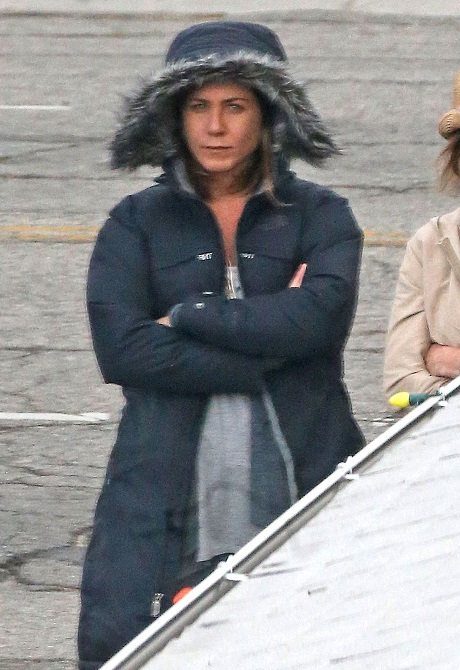 Jennifer Aniston Terrified Of Seeing Brad Pitt And Angelina Jolie At George Clooney Wedding! It’s been ten years since Jennifer Aniston got dumped by Brad Pitt for Angelina Jolie, but I don’t think there’s ever been a public reunion between all three of them. And when I say public, I mean all three of them within five feet of each other, shaking hands, and smiling – because what else are they going to do when the cameras are around? Sure, they’ve been at awards shows together, but they’ve largely avoided the awkwardness of reuniting, even for a few minutes. But since this is Hollywood, their blissful pretending-each-other-doesn’t-exist strategy will only work for so long. After all, George Clooney‘s wedding is coming up, and there’s little chance that we won’t see Jennifer, Brad, and Angelina there. George is the most popular guy in Hollywood, and everyone loves him. Jennifer [and her fiance Justin Theroux] know George well, as do Brad and Angelina. So I think it’s a given that they’ll all run into each other at the wedding, especially since the hustle and bustle of awards shows will be missing and it will be a relatively intimate affair. Obviously, there’ll be no way of avoiding each other at the wedding without drawing attention to that fact, so I think both Jennifer and Brad have pretty much resigned themselves to having that awkward face-to-face encounter. Role plays? Uh-huh. But it’s conceivable that Jennifer has been prepping to finally meet Brad and Angelina together, even if she’s avoided this for the past ten years. But at least she has Justin with her? Imagine her meeting them without anybody by her side? Eeek, that might have been cringe-worthy. As it is, I’m pretty sure nobody will walk away from this meeting without feeling visibly uncomfortable, but at least it’s easy to get over with.